There are many different types of diets out there, and they all seem to do the same thing. They all claim that you can lose weight quickly if you just follow the strict rules, but can this sometimes get you into trouble? Researchers have found that people who consume diets that contain high amounts of animal protein—relative to carbohydrates—such as vegetables, whole grains, and fruit tend to be heavier and have larger waists. Why is this the case? People who eat a diet high in animal protein tend to eat a lot more saturated fat, which has been shown to influence insulin secretion in the same manner that sugar does. The consumption of high amounts of saturated fat leads to insulin resistance and higher levels of inflammation, which actually encourages fat accumulation in the fat cells. The consumption of a high-protein diet mostly composed of animal protein sources can also be very problematic in people who have metabolic syndrome or type 2 diabetes. Metabolic syndrome is a condition of increasing levels of insulin resistance, which can precede the diagnosis of diabetes. If you have either of these conditions, the consumption of a diet high in animal protein can cause kidney dysfunction. I say this because a lot of these patients are overweight and have been told to lose their excess weight fast; this type of diet can cause damage to your kidneys, so I do not recommend anyone that fits this medical profile experiment with trying the high-protein diet. Some types of people who eat more saturated fat from their high intake of animal protein have higher rates of cancer occurrence. The intake of saturated fat has previously been linked to cancers of the upper and lower digestive tract. High intakes of saturated fat cause an increased level of inflammation and free radical generation; over time, this can cause the sensitive cells which line your digestive tract to become cancerous. In addition, diets like the high-protein diet are typically lower in fiber and antioxidant nutrients, which would normally help prevent this type of cancer from developing. It has been known for quite some time that an increased intake of animal protein can lead to a greater risk of cardiovascular disease. The saturated fat associated with the high-protein diet increases the blood levels of cholesterol, inflammation, and blood clotting factors. In addition, diets high in protein also contain less good fats, which guard against the formation of vascular disease, as do the aforementioned fiber and antioxidant nutrients that a high-protein diet is lacking. The consumption of higher amounts of protein can be a problem, depending on the type of protein. For instance, if you choose to eat protein sources primarily from the red meat category, your intake of saturated fat will be quite high. However, if you choose a better source of protein, like white poultry, fish, low-fat dairy, and vegetable sources, your risk of diabetes will actually decrease, despite the fact that you are consuming a high-protein diet. 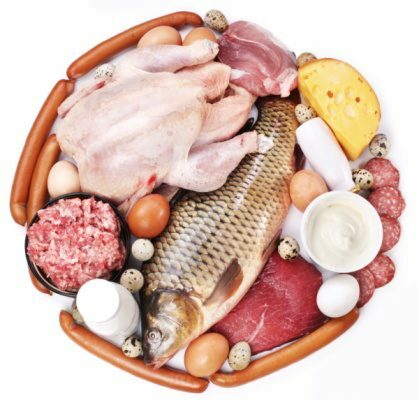 Have you ever tried a high-protein diet? What was it like? Macinnis, R.J., et al., “Predictors of increased body weight and waist circumference for middle-aged adults,” Public Health Nutr. May 2013; 1: 1-11. Meek, R.L., et al., “Glomerular cell death and inflammation with high-protein diet and diabetes,” Nephrol Dial Transplant. January 12, 2013. Lagergren, K., et al., “Dietary proportions of carbohydrates, fat, and protein and risk of oesophageal cancer by histological type,” PLoS One 2013; 8(1): e54913. Lagiou, P., et al., “Low carbohydrate-high protein diet and incidence of cardiovascular diseases in Swedish women: prospective cohort study,” BMJ. June 26, 2012; 344: e4026. Ajala, O., et al., “Systematic review and meta-analysis of different dietary approaches to the management of type 2 diabetes,” Am J Clin Nutr. March 2013; 97(3): 505-16.